- No glue, no mess, no fuss. - Saves time and money! The Result - Super voluptuous, clump-free and incredibly longer and thicker eyelashes by 300 percent. The brush on nylon fibres are lightweight and adhere to your own lashes when it sticks to the Transplanting Mascara Gel, resulting in dramatically longer and thicker lashes within seconds. Instant eyelash extensions with no fuss, no glue and natural ingredients to stimulate longer and thicker lashes. - Made from high grade natural beeswax helping stimulate lash growth and promotes longer and thicker lashes when used frequently. Beeswax is a natural high grade moisturizer and antiseptic resulting in a three year shelf life. 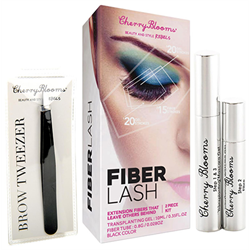 - Black nylon fibres, 100 percent natural, hypoallergenic and will not cause any irritation to the eyes when sealed properly with Transplanting Mascara Gel. Suitable for sensitive eyes and contact lens wearers.